Organizing your workspace just isn’t enough to help you perform at your best. Those homeless piles can be a symptom of other things that are going on. It’s why I developed the Smart Productivity© System. Using the Smart Productivity© Assessment helps to identify and examine which areas and/or behaviors may be limiting your effectiveness at work. These four key categories contribute to your overall productivity. Balance – Looking after your foundational needs plays an essential role to productivity since when you feel good you work well. The consequences of not having these operating optimally can create overwhelm, frustration, anxiety and stress. 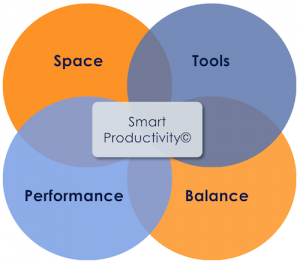 Contact me for more information on how you can get your own Smart Productivity© Assessment.